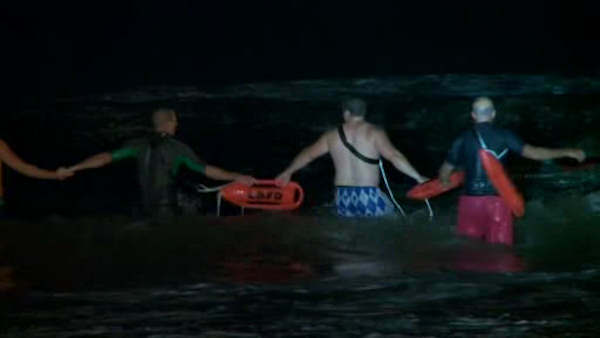 LONG BEACH, New York -- The Coast Guard has suspended its search for a missing swimmer in the waters off Long Beach Monday. People nearby say they saw the man getting into the water about 10 p.m. Sunday near Franklin Boulevard. He did not resurface. Good Samaritans reported the missing person as a white male wearing gym shorts and no shirt, about 6-feet tall, 180-200 pounds, and 30 to 50 years old. Police conducted a search by air and water for nearly 90 minutes, before turning over the search to the Coast Guard. The search was set to resume at daybreak, but the Coast Guard said it was suspended by 9 a.m.
"There was no missing persons report, and after using all our resources to search by sea and air, we have suspended operations," it said in a statement.